I have no business inventing recipes for baked goods. I am an inexperienced and impatient baker, and my assets as a cook, such as an inclination to omit or improvise ingredients and eyeball measurements, frequently sabotage my efforts as a baker. Yet, I am about to present my own recipe for muffins. Muffins that came to me in a dream. Somewhere in the foggy state between sleep and first morning light, a steamy muffin presented itself. Studded with rosemary, the muffin was both sweet and savory, the kind of thing one could enjoy at breakfast with a plate of scrambled eggs, or along side a soup of chickpeas and pasta. Did such a muffin exist? I hoped not, because I really wanted to invent it myself. Like a man looking for a hidden bottle of mustard in the refrigerator, I did a weak scan through my cookbooks and the internet. I was pleased to discover that, so far as I could tell, my somnolent vision had yet to be realized. While there were several variations on Italian rosemary and olive oil cake, instinct told me that the dream muffins employed butter. And although the majority of recipes I found called for lemon, I wanted to avoid anything tart and zesty so as to focus on the bitter, salty, and sweet. While I thought they might benefit from some bittersweet orange zest, the idea of lemon just didn’t jive with my muffin concept. Do your eggs say WWII? Good, we’re ready to start. My dream muffins didn’t take long to make, and were simple at that. Because I hate day-olds, I made a small batch of six; for a complete dozen you should double the measurements that follow below. As I had hoped, they were both salty and sweet. Using buttermilk and some extra baking powder helped to keep them fluffy, and the crunchy topping accented each bite with rosemary, sugar, and salt. 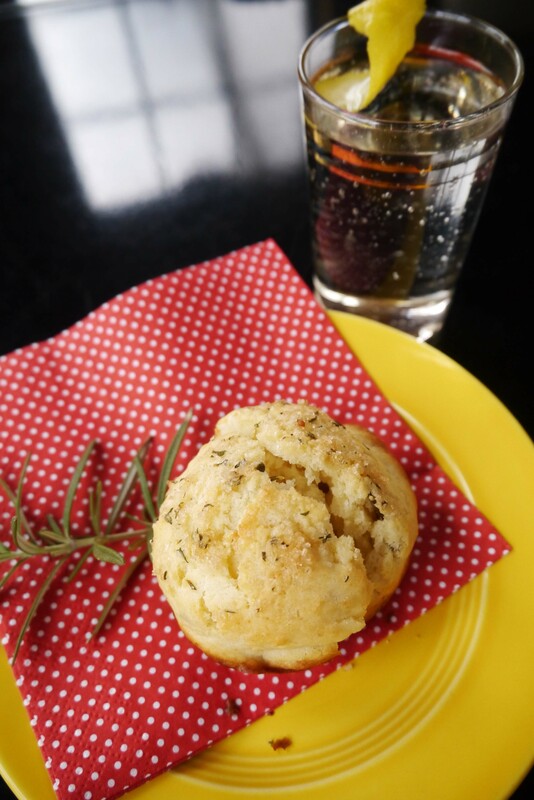 I enjoyed my first dream muffin as a midday snack, with a tiny white wine spritzer, made just the way my Italian friend, Guissepina, enjoys them – one part crisp white wine to one part mineral water, with a thick strip of lemon rind. It was so good I partook in another – of each. I will report here that my second muffin received a thin layer of orange marmalade, and did not suffer for it. Preheat the oven to 400 degrees and grease your muffin tin with butter (or, better yet, use paper liners). Finely chop the leaves from two sprigs of rosemary, yielding about two tablespoons. In a small dish, mix 1 tablespoon of the rosemary with 1/2 teaspoon of coarse salt and 2 tablespoons of coarse, raw sugar. (Optionally add 1 teaspoon of orange zest.) Gently macerate this mix, which will serve as your muffin topping. In a saucepan melt 1/2 stick of butter (4 tablespoons) with the remaining 1 tablespoon of rosemary and 1/2 teaspoon of salt. Allow to brown slightly, and set aside. Blend 1 cup flour and 1 teaspoon baking powder in a small bowl. In a medium-sized mixing bowl, lightly whisk together 1 egg and 1/3 cup sugar. Add 1/2 cup buttermilk (milk will work fine, too), and the rosemary-butter; mix together wet ingredients. Add in the flour mix and whisk until combined – do not over beat. Spoon the muffin mix into your prepared cups, and top with the rosemary, sugar, salt mixture. Bake for about 20 minutes.